Hearthside Food Solutions is a case history in keeping up with the complexity of snack manufacturing. A quality inspector monitors a bar line in a Grand rapids, Mich., plant of Hearthside Food Solutions. it’s one of five high-capacity bar lines in the company network. The manufacture of snack foods was once a relatively simple operation. Compared to meat or dairy processing, snack processing offered far fewer worries about contamination and care of raw materials. Mixers, extruders and ovens were fairly basic equipment, and with the right time and temperature, everything came out in the wash. Things have changed. "In the snack and baking [categories], recent consumer trends call for more complex products," says Dwayne Hughes, vice president of operations at Hearthside Food Solutions (www.hearthsidefoods.com), Downers Grove, Ill. "That product complexity means more inclusions, [which introduces] more allergens, and more challenges for the manufacturer in terms of allergen control and validation." "The variety seems almost endless anymore," agrees Steve Johnson, director of marketing at Key Technology Inc. (www.key.net), Walla Walla, Wash., which supplies conveying, sorting and weighing systems to the food industry, including potato chip manufacturers. "The market segmentation is very precise now. Manufacturers can identify very particular market segments and answer the needs of those segments." 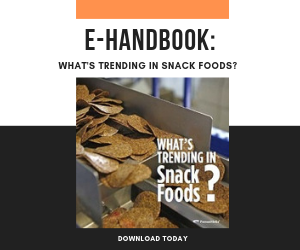 While those positive market forces have moved snack foods in a certain direction, food safety failures, and the subsequent mandates for stricter manufacturing control, also have had an impact on how everything from potato chips and pretzels to granola bars and nuts are produced and packaged. The Food Safety Modernization Act, currently being implemented in stages, hits hardest in industry segments that previously were less-regulated, including produce, baking and snacks. It has been a little more than two years since Hearthside Food Solutions LLC reached its current form through the consolidation of three baking companies. Headquartered in Downers Grove, Ill., Hearthside is a baking-heavy contract manufacturer. It includes 13 facilities that formerly made up Ohio-based Consolidated Biscuit, Oregon's Golden Temple, and selected Michigan facilities formerly owned by Michigan-based Roskam. Those plants are located in six states in the Midwest and the Pacific Northwest. The company currently has annual sales of more than $800 million to customers that include some of the top food manufacturers and brand holders in the world. Hearthside's facilities include 36 ovens and a variety of packaging lines that produce cookies, crackers, granolas, components, bars, breads, cereals and baked bars. Dwayne Hughes, vice president of operations, is a food industry veteran having helped lead operations at companies including Nabisco and ConAgra. Prior to joining Hearthside, he was vice president of supply chain of Ralcorp Frozen Bakery Products. Nearly 3 million sq.ft. dedicated to bakery manufacturing and packaging. Over 7.5 acres of warehouse and distribution space. An equipment prototyping and design facility. More than 50 high-speed and custom packaging lines. The largest and longest independent ovens in North America. An SAP-driven environment tailored to large-scale customers. A front-to-back integrated supply chain serving all facilities and all customers. Hearthside's corporate entity was formed in 2009 through a partnership between private equity firm Wind Point Partners and food industry veteran Rich Scalise, who also serves as Chairman and CEO. On the day it launched, the company had four manufacturing plants and some 2,000 employees. By 2010 the company had more than doubled in size. Today Hearthside employs more than 5,000 full-time employees. Before founding Hearthside, Scalise spent more than 30 years in food industry management, most recently as president of Ralcorp's Frozen Bakery Division. , and now claims to be one of the largest contract bakery manufacturers in the country, providing an array of bake and snack components to major food-brand holders coast to coast. It is working to implement quality practices and programs that ensure efficiencies, uniformities and traceability improvements that are demanded by the current food safety environment. "From a co-manufacturing perspective, because the food regulations are changing under the Food Safety Modernization Act, and due to the quality programs of our customers, we are getting audited all the time," Hughes says. "With 13 plants, we have an auditor inside one of our plants on a 24/7 basis. With the FDA adding more federal inspectors, we are getting more visitations and more routine and non-routine inspections." To continue to meet new regulatory requirements, as well as the expectations of its food manufacturing customers, Hearthside is spending millions of dollars each month on line improvements, packaging automation and other capital resources. It is also implementing a series of quality programs. "We are spending anywhere from $50 million to $60 million a year on expansions and on removing cost and inefficiencies through automation and better control," Hughes says. These efforts included robotic palletizers in 2010, and a completely automated packaging line with robotics that was recently completed at one of Hearthside's Grand Rapids, Mich., plants. "We are doing more gas packaging, so that customers can offer longer shelf life on products, and we have made numerous improvements in all areas," says Hughes. Other improvements have included: multiple new cookie and cracker direct fire ovens, several new enrobing lines in multiple plants, an additional cold-form bar line and expanded form/fill/seal packaging capacity. Better equipment is part of the puzzle, but practices are at least equally important, as snack processors and bakers work to improve their scorecard. "Because the company started from a series of acquisitions, we really had three distinct cultures," Hughes says. "So those came with a variety of continuous improvement and best practice programs including things like TPM, Lean and Six Sigma. These are all different pieces of the continuous improvement model we are using. The company is also moving to SAP 6 for its communications, and to a 5S program on the floor. "It takes a long time to get that process in place," Hughes says of 5S, a Japanese-origin methodology of workplace organization. "It means everything has a place and that everything is in its place. It takes a while to get your workforce completely involved in that process, but when you walk into a plant that is 5S you can really see the difference compared to one that is not 5S." Hearthside also has lead plants, followers and shadow plants for areas of specific improvement. Where possible, improvements made in the lead plants will be extended to all or at least some of the other facilities, Hughes says. Energy-saving efforts have been implemented on a number of fronts, including low-wattage, high-efficiency lighting installed in all plants through a federal initiative program. Water conservation efforts have focused on things such as dry cleaning prior to wet cleaning. New technologies in sorting offer plenty of opportunity for companies like Hearthside to make measurable improvements in production efficiencies. Johnson, from Key Technologies, says sorting and handling can often harbor scenarios that leave room for improvement. "One of the things that speaks to the quest of customer satisfaction is optimizing yield," Johnson says. "As an example, Key Technology is about to launch a new sorting solution using algorithms to optimize the grading of product. "Traditional manual sorting at its most basic involves grabbing the bad material," Johnson says. "Optical sorting does that on a more finite level and provides a two-way stream of pass and reject — rejecting for size irregularities and other defects." But newer sorting systems feature three-way streams that include a reject and a good and medium grade. The good and medium can be blended in an "acceptable" proportion and then combined for packaging. Johnson uses the example of walnuts. "A whole blonde walnut is the ideal, and those are very valuable," he says. But broken blonde and whole black walnuts can be blended with the whole blondes to create a product that is perfectly acceptable for many applications." To optimize the packaging operation, food processors – or their line integrators – must understand the interaction of the components and consider the line holistically rather than as separate machines that are connected. Fully integrating the controls costs more initially, but the added cost is quickly recovered by increases in overall equipment effectiveness (OEE) and the increased output of the FFS machine producing salable bags. Technologies that can boost productivity and reduce waste continue to emerge, and they are finding applications throughout all areas of the snack-processing facility. In order to avoid allergen contamination, Hearthside has segregated its facilities into three groups—nut facilities, nut-free facilities and peanut free facilities. Allergen control is one of the most crucial issues facing snack manufacturers today. It coincides with less life-and-death concerns such as organic certification, free trade and environmental/production issues.